Marvin Test Expansion Kit - Tester Upgrade Solution for Legacy Test Systems | Marvin Test Solutions, Inc. The MTEK (Marvin Test Expansion Kit) Series is a cost-effective, PXI-based test solution that offers modern instrumentation with advanced specifications - extending the life and capabilities of legacy ATE. 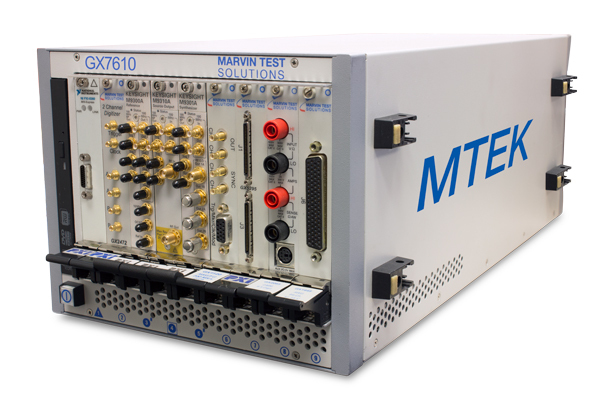 Based on Marvin Test Solutions' portfolio of PXI chassis and instrumentation, the MTEK Series can be readily integrated with a legacy ATE platform, providing advanced digital, analog or RF test capabilities. Based on the open architecture of PXI, the MTEK system offers a flexible and scalable solution which can be specifically configured to address a range of test needs for both packaged and wafer test applications. Designed to support both engineering and high volume production installations, the MTEK Series is the ideal low-cost solution for extending the life cycle of legacy semiconductor ATE systems. The MTEK Series core platform includes a 9-slot, PXI Express chassis and a MXI interface which provides the control interface to the host ATE system. The MTEK's compact form factor simplifies mechanical integration with the legacy test system and users have the option to interface the MTEK's resources via the DUT's load board or the tester's receiver interface. The MTEK system is supplied with Windows® compatible instrument drivers and virtual instrument panels, which provides interactive control and monitoring of the instruments from a window that displays the instrument’s current settings and status. In addition, digital instrumentation is supplied with graphical vector development / waveform display tools and as an option, a file import tool is available for importing and converting STIL, WGL, VCD, eVCD and ATP file formats.